New hepatitis C drugs are extremely effective, but their price tags are a jaw-dropper. A three-month treatment course can easily cost $70,000-$100,000. It’s pretty obvious that at this price the vast majority of uninsured patients can’t afford the treatment. What is little known though, is that the situation is hardly better for those covered by state insurance programs. In 2014 in California, for example, 94% of those who requested hepatitis C drugs through Medi-Cal were denied coverage. Meanwhile, in the same fiscal year the state has paid $58 million to treat prisoners with advanced stages of hepatitis C.
The situation in California is not unique. 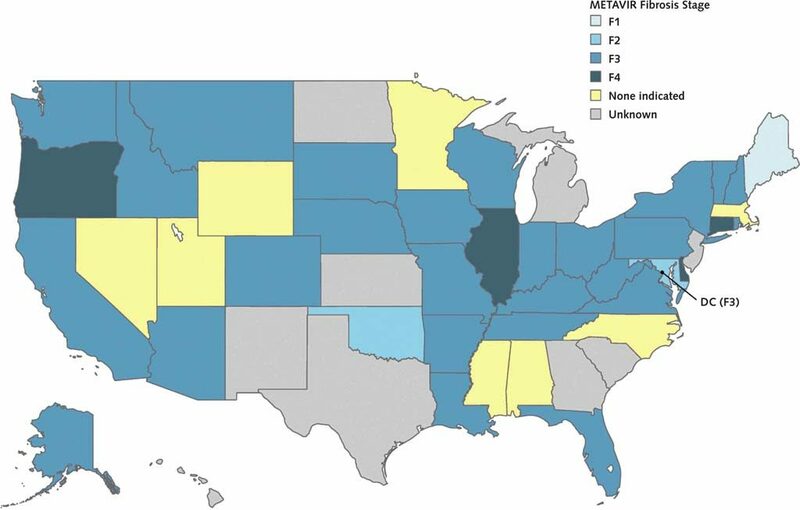 Of the 42 states where Medicaid actually reimbursed sofosbuvir, the active substance of Sovaldi® and Harvoni®, 74% limited treatment access only to persons with advanced fibrosis (F3) or cirrhosis (F4). The vast majority of states (88%) include drug or alcohol use in the eligibility criteria, requiring either a period of abstinence or urine screening; two third of states impose restrictions based on prescriber type. Among the commonly recommended treatment regimes for hepatitis C are Sovaldi®, Harvoni®, Epclusa® and Viekira Pak®. These limitations don’t match the latest recommendations for hepatitis C treatment. In fact, initiating therapy in patients who did not yet develop severe fibrosis augments treatment benefits, while treatment delay decreases it. Current restrictions also seem to violate federal Medicaid law, which requires states to cover drugs consistent with their U.S. Food and Drug Administration labels, Annals of Internal Medicine explains. The reason behind these restrictions is not ill will, but simple economic reasons. In the state of Washington, for instance, officials estimate that even with a 50% discount treating everyone on Medicaid for hep C would cost three times the state’s total pharmacy budget. Simply put, the insurers are caught between Big Pharma’s sky-high prices and HCV advocates who say that rationing care is illegal. Unfortunately, even qualifying for the treatment doesn’t mean getting it. With many health insurance plans the deductibles remain ridiculously high. For example, those who benefit from Medicare health plans have a 50-50 chance of getting their treatment with Viekira Pak® covered. 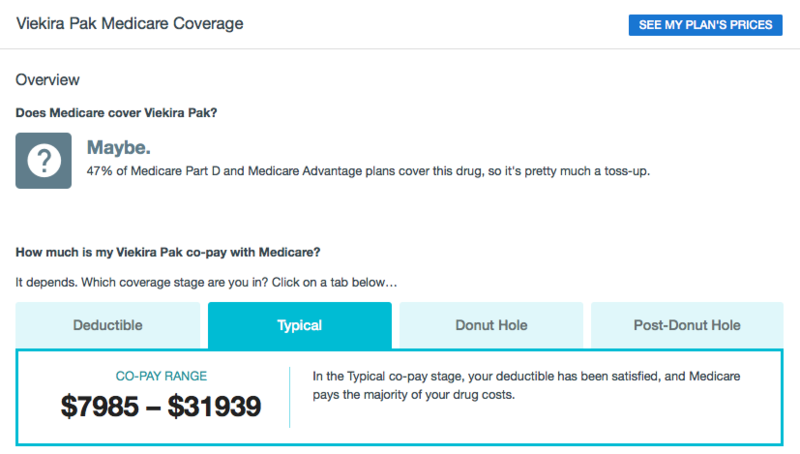 According to GoodRx, the deductible varies anywhere from $7,900 to $32,000, per month. Technically, almost any Medicare plan will cover hep C treatment with Harvoni®, but the extent of the coverage is undependable. The majority of the plans only cover the treatment for the first 30 days. In reality it means that your deductible for the first month can be in the $9,000 range, but the treatment for each subsequent month will come with $32,000 bill. For the reference, recommended treatment duration is either three or six months, depending on previous treatment history with interferon and the exact stage of liver disease. Only in some rare cases the treatment duration can be reduced to two months, but never to one. Another problem is, the miraculous Harvoni® doesn’t work its magic for all the genotypes. Until recently, patients with genotypes 2 and 3 had to use Sovaldi® in combination with either interferon or Daklinza®. A three-months-long treatment with Daklinza® comes with $61,000 price tag. As for Sovaldi®, the out-of-pocket costs are around $80,000, and starting from 2016 the drug is no longer covered at all. On the bright side, later this year FDA approved a new drug for hepatitis C. Epclusa® can be successfully used for hepatitis C treatment regardless of genotype; and when it comes to genotypes 2 and 3, its efficiency is slightly superior compared to the previously existing regimens. It is cheaper, too: starting at “only” $71,328 per three bottles. What’s the bad news? Medicare wouldn’t pay for it. Even with a reasonably good private insurance the modern hepatitis C drugs remain out of reach for most. Private insurance companies deny coverage just as often as Medicare, arguing that the patients are not sick enough. And there’s the same clash between existing recommendations: insurance guidelines allow treating the patients with at least fibrosis level F3, while official HCV guidelines recommend that all the patients, except those with short life expectancies, get treated as soon as possible. So what should you do if you don’t qualify or can’t afford the treatment? There are plenty of things you could try, and we’re not talking about trying outdated treatment regimens, starting a crowdfunding campaign or robbing a bank. Here’s a detailed overview of available solutions. In summary, the most important thing is to seek assistance everywhere and not to give up. Many non-profits and pharmaceutical companies have hepatitis C support programs that help to pay the deductible. Waiting to develop advanced liver disease in order to be covered is utterly frustrating. Worse even, if you wait too long or try too many cheaper and less effective treatments, the new antivirals might simply not work for you! And what about those lucky ones who actually qualify for treatment? Based on several real-life stories, unless the patients have Cadillac insurance, their out-of-pocket costs skyrocket. Even with a pretty good insurance from work the medication costs can total about $11,000 out-of-pocket. When it comes to modern hepatitis C drugs, the patent owners argue that despite their high prices it is still a fair deal. And it is, if we compare these antivirals to their only alternative – liver transplant – that can easily cost $250,000 and more. Everyone knows that the market price of these drugs is set according to its “perceived value” and has nothing to do with their production cost. However, very few of us know how much (or rather, how little) the wonder drugs cost to produce. Dr. Andrew Hill and his team from the University of Liverpool have recently performed a study about large-scale manufacturing of modern hepatitis C antivirals. The results are shocking, to say the least. The minimum manufacturing costs of antivirals were estimated at $0.2–$2.1 per gram. For instance, a 12-week course with daclatasvir and sofosbuvir would costs less than $200 dollars to produce. Put the exact same active ingredient in branded packaging (Daklinza® and Sovaldi®), and it is sold at $141,000. This actually means that the profit margins for hepatitis C meds are way higher than those of illegal drugs! 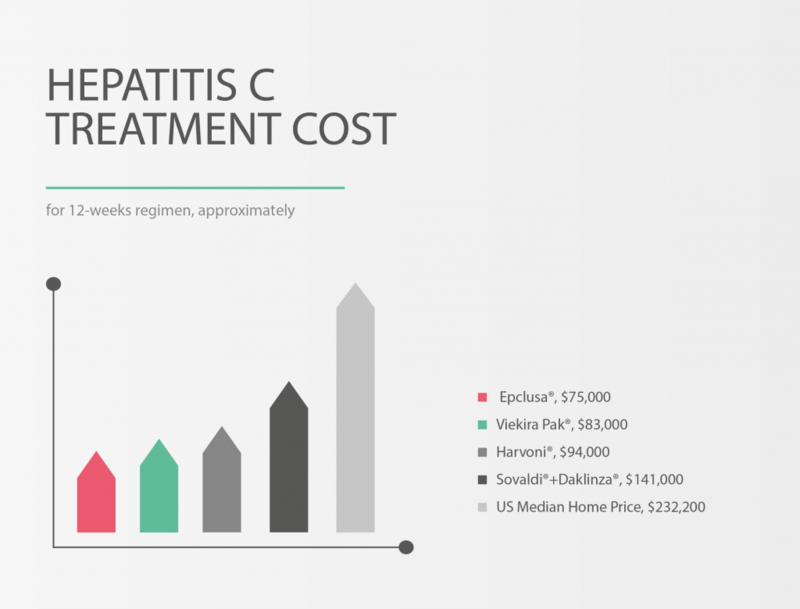 Manufacturing costs of hepatitis C meds were estimated at $0.2–$2.1 per gram. That’s less than $200 per treatment course. Dr. Hill’s study also explains why it makes perfect sense for Big Pharma to sign license agreements for generic production, like the ones signed with Indian pharmaceutical companies in 2015. The retail price of generic drugs in India is around $1,100, while the production costs varies between $10 and $136. This colossal profit margin is then split between the originator company and the Indian manufacturer.